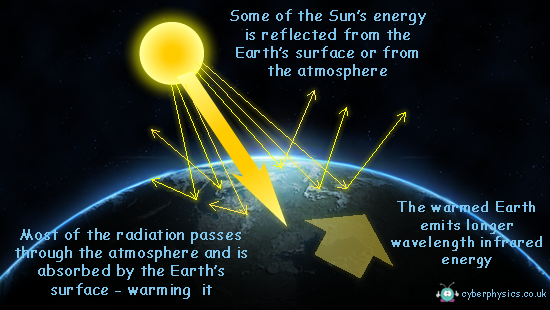 Electromagnetic infrared energy from the sun is absorbed by our atmosphere and the Earth's surface. This energy drives the Earth's weather and climate systems (see wind and wave power), and warms the Earth's surface. The Earth radiates some of that energy back out into space. But when it returns the energy into space as infra red radiation, it is of a longer wavelength. The hotter the body radiating infrared, the shorter the wavelength of the IR radiation. The Sun is very hot therefore the IR radiation we recieve is of a very short wavelength. 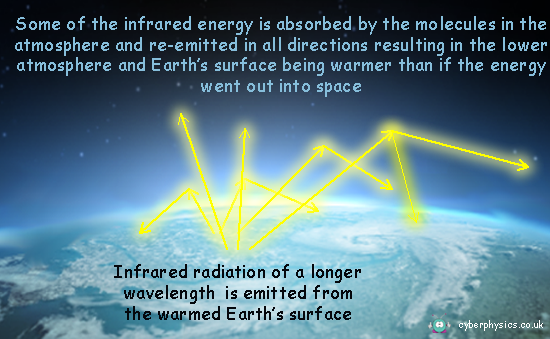 Once warmed the Earth re-radiates some of the energy, but at a longer wavelength. are particularly good at 'trapping' infrared energy of longer wavelengths, retaining heat energy within our atmosphere somewhat like the glass panels of a greenhouse. Without this natural "greenhouse effect," temperatures would be much lower than they are now as the Earth would radiate much more of the heat energy it got from the Sun straight back out into space! Life as we know it would not be possible. Instead, thanks to greenhouse gases, the earth's average temperature is a more hospitable 16°C. However, problems may arise if the atmospheric concentration of greenhouse gases increases. What will happen if Greenhouse Gases in our atmosphere increase? It is expected that the average global surface temperature could rise 0.6-2.5°C in the next fifty years, and 1.4-5.8°C in the next century, with significant regional variation. That doesn't sound much but it is quite significant. The average global temperature during the last ice age was only 5oC lower than today! Evaporation will increase as the climate warms (adding to the problem because water vapour is a greenhouse gas), which will increase average global rainfall. Soil moisture is likely to decline in many regions leading to crop failures and famines, and intense rainstorms are likely to become more frequent - leading to storm damage of buildings and crops. Sea level is also likely to rise and low lying regions will flood. This will be because the oceans will expand (as they are at a higher temperature) and also some of the ice and snow on land will melt (the ice in the sea melting will not affect the sea level...). As the climate changes, most species of plants and animals will not be able to survive in their current geographic locations. They will need to move to more suitable areas. However, whereas they had 10,000 years to adapt to a warming climate after the last ice age, they will have only 100 years if humans increase the temperature a similar amount in the next century  around 5 degrees - and that means many of them will become extinct. Scientists believe that global warming will not only bring higher temperatures, but also extreme weather variation. For example, what was once a 100-year flood might become commonplace and natural disasters such as hurricanes, tornadoes, blizzards, floods, and droughts will occur more frequently. Albedo is the fraction of solar energy (shortwave radiation) reflected from the Earth back into space. It is a measure of the reflectivity of the earth's surface. Ice, especially with snow on top of it, has a high albedo. That means that most sunlight hitting the surface reflects back out into space. Water is much less reflective - it has a lower albedo. So, if there is a lot of open water in the polar region, more solar radiation will be absorbed by the ocean than when ice dominated. That will speed up global warming. Teachers: click here to download a printable worksheet based on this page. to go to a page explaining where the Greenhouse Gases come from.